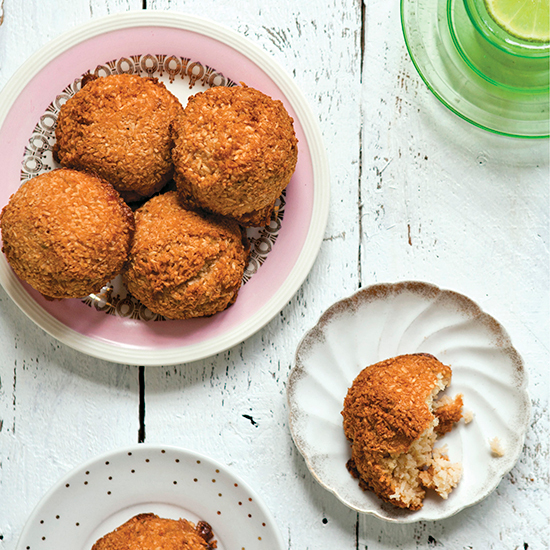 As long as you’re splurging on limes for Cinco de Mayo margaritas, you might as well grab a few more to make baker and cookbook author Kyra Bussanich’s spicy-sweet chile lime coconut macaroons. As long as you’re splurging on limes for Cinco de Mayo margaritas, you might as well grab a few more to make baker and cookbook author Kyra Bussanich’s spicy-sweet chile lime coconut macaroons. They’re crunchy on the outside and chewy on the inside with a fantastic kick from the cayenne. Bonus: They’re gluten-free. Make them tonight using the recipe below from Bussanich’s book, Sweet Cravings: 50 Seductive Desserts for a Gluten-Free Lifestyle published by Ten Speed Press. 1. Preheat the oven to 350°F. Line two large baking sheets with parchment paper and set aside. 2. In a large bowl, combine the coconut, sugar, coconut flour, lime zest, cayenne, and salt. In a separate bowl, mix together the egg whites, honey, and vanilla. Make a well in the coconut mixture and pour the egg white mix into the center of the well. Stir together until thoroughly mixed. 3. Drop golf ball–sized scoops of the coconut mixture close together onto the baking sheets. Bake until dark golden brown and set to the touch, 22 to 28 minutes. Let cool completely on the baking sheet, then peel off of the parchment and store in an airtight container. You can make the “dough” ahead of time and freeze unbaked on the baking sheet for up to 2 weeks or freeze in an airtight container once they’ve been baked for a month (if they last that long). Reprinted with permission from Sweet Cravings: 50 Seductive Desserts for a Gluten-Free Lifestyle by Kyra Bussanich (Ten Speed Press, © 2013).